The 2010 edition of The Associated Press Stylebook contains a new section on social media guidelines. The style rules, published by the global news network Associated Press (AP), help provide consistency for news providers on things like spelling and formatting. The print edition is updated annually, with major periodic revisions since its first edition in 1953. “Web” is to be capitalized. “Fan,” “friend,” and “follow” can be used both as nouns and verbs. One of the most controversial changes is “Web site” to “website.” The AP announced in April that it would be making the switch, based on common usage online and in print. “In making the change, the Stylebook team considered responses from our staff as well as readers and users of the Stylebook. It was clear that website has become the widely accepted usage,” said Darrell Christian, AP editor-at-large. “We solicited reader suggestions for the new Social Media section and received 237 responses, with a large number of commentators urging us to change to website,” he said. I think it’s about time AP correct a couple of grievous misuses of words. First, it’s ‘Web site,’ not website. It comes from the World Wide Web (note the caps), and in this case, Web modifies ‘site.’Hence, two words. Second, and along the same lines, ‘back yard’ is two words when used as a noun, not one. The noun is ‘yard,’ and the modifier is ‘back.’ Hence, two words. It’s used as one word ONLY when combined to modify something else: backyard pond or backyard grill. AP decided a couple of years ago to make ‘back yard’ one word in all uses. And yet you left ‘front yard’ as two words. Illogical. And just plain wrong. Please fix these things and restore editors’ confidence in AP style. I’m a stickler for some grammar rules, but not so much on others. Language is ever-evolving and rules that made sense in the past may not particularly pertain now. Blogging styles confirm this. Not that a blogger should take it to a level where it is necessary to read his sentences multiple times to understand the meaning, but online communication does tend to be more informal than print. Christian’s quote above illustrates how the rules are sometimes defined by the masses. Even here at SixEstate we grapple with such discussions on a regular basis as we determine in-house style. We usually default to AP guidelines, but also make some decisions based on our own tastes. The most important thing is that we try to maintain consistency across all of the blogs that we manage. How do you determine house style for your blog or website? Please add a comment and let us know how you’ve developed your own style guidelines. You can check out the AP Stylebook on Twitter (@APstylebook) or for a bit of humor, check out The Fake AP Stylebook (@ FakeAPstylebook ). 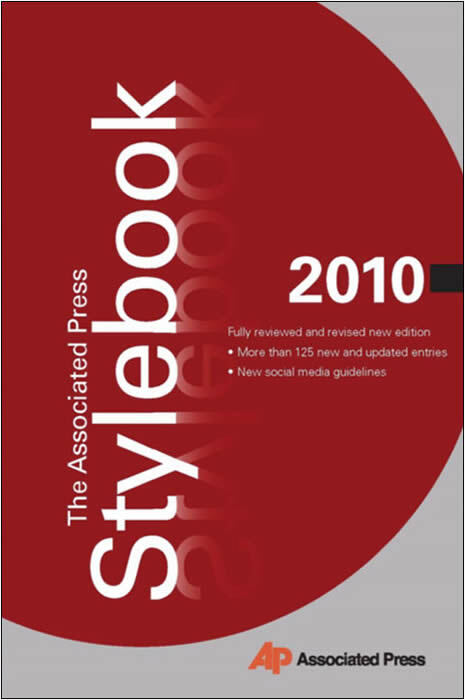 Cover image of The Associated Press Stylebook, 2010 Edition used under Fair Use: Reporting.